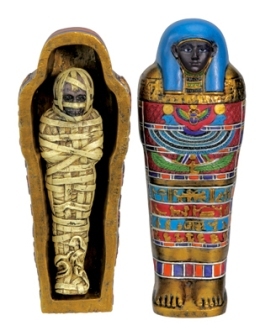 This gorgeous cold cast resin piece measures L: 1.75' x W: 1.5' x L: 4' is hand painted and includes a mummy. The sarcophagus lid lifts off for you to find the mummy inside. If you'd like a larger version of this item we also carry it in the 7 inch version.